The role of nuclear weapons in modern policy, politics, and national security will be discussed by Dr. Hawkins, Senior Fellow at Los Alamos National Laboratory (LANL). 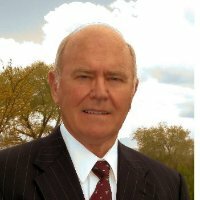 Colonel Houston T. “Terry” Hawkins (USAF Retired) is the Senior Scientist, Principal Associate Directorate for Global Security (PADGS) at Los Alamos National Laboratory. He is an internationally recognized specialist on modern terrorism particularly terrorism involving the potential use of weapons of mass destruction. Since coming to Los Alamos in 1988, he has lead major technical programs aimed at detecting, preventing and reversing the proliferation of weapons of mass destruction. Terry has received numerous awards and recognition for his work including the Earl Warren Medallion, the Aviation Week & Space Technology 2000 Laurels Award, the Valley Forge Freedoms Foundation Medal, the Legion of Merit, and two Defense Superior Service Medals. He is a graduate of Clemson University, National Defense University, and LaSalle Extension University School of Law.